So this technically isn't a favourites post, but then again, perhaps it is. Today I'm sharing a rather lengthy list of products I've finished up recently. In the pots/tubes/etc etc... is nada. Literally nothing. So, I guess you could say that indicates that they're favourites, right? Let's start things off with a couple of gems from my ultimate skincare brand, Origins. If you haven't sampled from the brand, you're seriously missing out I tell ya. 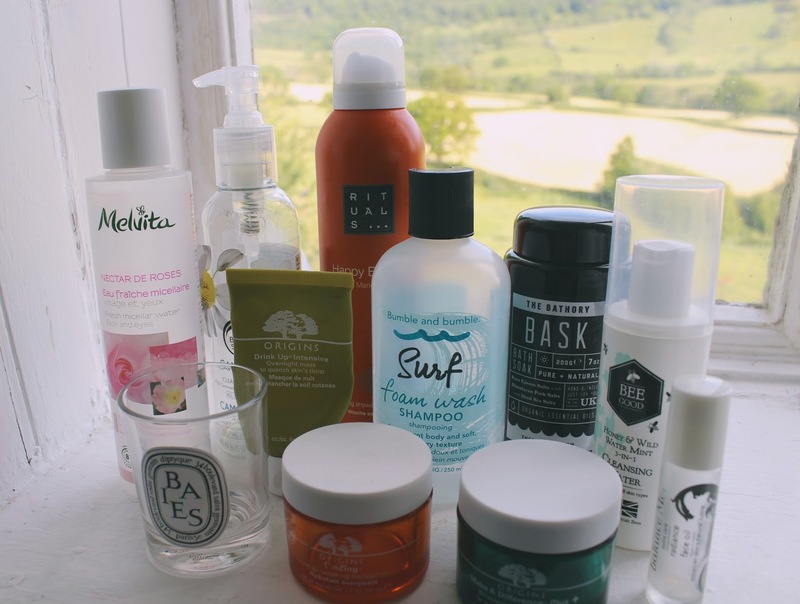 Whilst I could talk about the brand till the cows come home, three products, yes, three, (told you I was hooked) I've finished up recently definitely need a mention in this here post. The Ginzing Energy-Boosting Moisturizer is magical stuff. Radiance boosting, glow giving goodness. If you fancy reading up on the product, check out my review here, however if you're simply looking for a quick, snappy summary, then all I'm gonna say is buy it. It rocks and your skin will seriously thank you for it. Darn I am such a product pusher. The Make a Difference Plus + Rejuvenating Moisturizer is, not only a complete mouthful of a name, but equally awesome. The combination of this and Ginzing keep my complexion in a happy, happy place, and since I've run out, I have noticed a total change in the appearance of my skin - and not in a good way, FYI. To put it quickly, the stuff keeps my complexion soft, hydrated and glowy, and who doesn't want that, right? Finishing the Origins collection, we have the Drink Up Intensive Overnight Mask. This stuff smells ah-mazing. Mango, summery goodness in a tube. My Mum raves about the original, 10 minute alternative (haven't tried) however I absolutely adore this and can 100% guarantee that those with skin craving moisture will too. Check out my review here. Another beauty-shaped brand that holds my heart, is Bumble & Bumble. Over the years I've tried and tested several of their products, however one of my all-time favourites is the Surf Shampoo. Whilst I think may prefer the Seaweed alternative, it is indeed a splendid rinse for achieving natural waves at ease. Plus, it's another one that wins in the amazing scent department. If you fancy a more in-depth review, whizz over to my post, here. I'm gonna struggle with this one, as words simply can't describe how amazing it is. I've been wanting to sample Diptyque for the longest time, and thanks to the Liberty London advent calendar, I have. Floral and fruity, Baies isn't something I would normally opt for from description, but since trying it out, my views have changed entirely. It's divine, luxurious and fills the room unlike any candle I've burnt before. Of course, I typed up a little review earlier in the year, (here) but if you're on the hunt for a new candle, or to treat yourself to something special, you'll love this. Perhaps my all-time favourite cleanser is courtesy of The Body Shop. The Camomile Silky Cleansing Oil is supposedly a cracking dupe for high end oils such as Bobbi Brown's, and damn, it's great stuff. For £10, you get a 200ml bottle (with a pump, huzzah!) and despite everyday use, it lasts forever. I've since been out and bought a replacement as my skin can't go without it. Continuing with the facial oil theme, we have the Balance Me Radiance Oil*. Not only is it entirely fabulous, but entirely natural. I was moderately new to the whole oil trend until last year, and now I'm hooked. Using this everyday, alongside the above skincare products helped to keep my skin in check. Big thumbs up from me. Review here. Double cleansing is something I like to incorporate into my everyday routine, and two micellar waters I've tried and used up recently are definitely worth a mention. The Bee Good Honey and Wild Water Mint 3-in-1 Micellar Water* is something I reviewed in my 'five cleansers that rock' post. It's gentle, natural and doesn't aggravate my skin. Lovely stuff. I recently also had the pleasure of trialing Melvita's Fresh Micellar Water*. Again, suitable for both the face and eyes, it's enriched with rose petal extract and is a quick-fix cleansing solution. So I've already mentioned this one recently on my blog. and I think it may just be my favourite of the 'empties' bunch. The Bathory Personalised Bath Salts* are as opulent as they sound. If you dig baths, relaxing, and nice smells (which I'm sure you will...) they you'll love The Bathory. Have a read of my review for the full 411, but they are seriously amazing. To wrap things up on this ridiculously lengthy post, (congrats is you've got this far) we have the Rituals Happy Budha Foaming Shower Gel*. I guess it's quite hard to get revved up about a body wash, but this was a real pleasure to use. The gel to foam texture is super cool and the mandarin scent makes the whole shower experience way more bearable come those sleepy, sleepy mornings. I would definitely recommend trying out the Rituals shower gels for yourself. What products have you used up recently that you can't live without? I'm so obsessed with Bumble & Bumble! Since using my candle I've popped all my cotton buds in and it looks oh-so pretty.